Our precision components provide safe and leak free fluid dispensing from syringe barrels. Caps are used to seal barrels for safe storage of liquids inside. The caps are quick to attach and easy to remove. 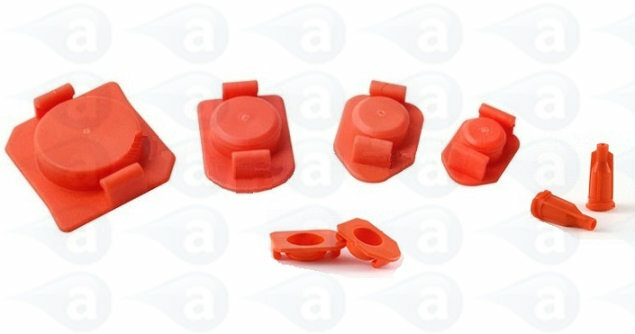 Re-usable end caps for sealing the top of the syringe barrel in sizes 3cc, 5cc, 10cc, 30cc and 55cc. Polyethylene for an air tight seal preventing any leaks and ensuring fluids can be stored inside the barrel safely. Tip caps are used on the luer lock end of any sized syringe barrel, cartridge adapter or metering valve and feature a double helix thread for secure leak free attachment. Caps are silicone and chloride free to prevent contamination of any fluids stored inside the barrels and are supplied in sealed packs. All items ship from stock.